Ok, so will you guys kill me if I post two mashed potatoes recipes in the same week? I probably could have done with some better timing but with Thanksgiving (and Christmas soon after) looming and mashed potatoes such an important part of the meal, I wanted to get this Make-Ahead Slow Cooker or Oven Mashed Potatoes recipe out. And not to worry, I have a teaser – a beautiful, easy and feast worthy Chocolate Tart coming up along with a couple of fun Thanksgiving-y recipes. Make-Ahead Slow Cooker or Oven Mashed Potatoes are a workhorse recipe. It’s a great recipe to have if you are asked to bring mashed potatoes to someone’s house or to a potluck. It’s a great recipe to use, too, if you’re hosting a crowd and don’t need the hassle of making your mashed potatoes last minute or don’t have the stove/kitchen space to coordinate all the last minute prep. And talk about stress saving! Mashed Potatoes are my desert island food – that’s the food you pick if you were stranded on a desert island and could only have one food until you are rescued. Normally I wouldn’t dream of making mashed potatoes ahead because I’m kind of a freak about them! But when faced with that last minute flurry of putting on a feast for a crowd, making your mashed potatoes a day ahead and reheating for your Thanksgiving or Christmas feast is the way to go. Now, if you’ve had “leftover” mashed potatoes, you know they’re ok the next day, but not necessarily stellar, so even your (or my) Best Mashed Potatoes aren’t a great candidate for this make-ahead strategy. Make-Ahead Slow Cooker or Oven Mashed Potatoes get around that with the addition of a few ingredients that are going to keep those potatoes uber creamy, delish, rich and fresh tasting. And that’s great for a holiday when you’re going to be splurging, anyway. Make-Ahead Slow Cooker or Oven Mashed Potatoes can be really good or a total fail – the key is to trust the recipe, don’t futz with them and use good mashed potato technique. They’re basically fooling proof if you do that! And keep in mind that these potatoes are rich and creamy and that can dull seasoning, so we’ll compensate and cook those potatoes in salty water. When cooking, peel your potatoes and cut in good sized chunks, about 2 1/2 inches. Boil them in seasoned water until they’re just tender; don’t cook them until they’re falling apart. Mushy potatoes make mashed potatoes that will be watery and separate. If you want to peel your potatoes ahead and keep them in water so they don’t turn brown, that’s fine, but don’t’ cut them until you’re ready to cook. Once your potatoes are done, drain quickly and thoroughly and return to the hot pot. You might need to put the heat on low, but leave them in the pot until the excess water evaporates. You can lift some of the potatoes up from the bottom with a spatula, but don’t stir them a lot. When most of the steam is gone and the potatoes look dry, move on with your recipe. Then mash by hand or with a mixer (you can use a ricer if you want, but these are a lot of potatoes) until they’re broken down. Only then add your dairy. When you add the dairy, start with the butter first and mix just enough to mix it in, then add the rest of the dairy. Then leave it alone. Don’t keep mixing. Don’t fuss with them. Once you overmix and break those potatoes down too much with the dairy, they’re going to get gluey and lose their ability to hold on to moisture and that’s no good, especially when making ahead. That is seriously the only thing you can do wrong. Actually, there is one more place where you can go wrong: ignoring food safety. Hey, someone has to say it! Cool these quickly and never put them in a slow cooker liner and put that liner in the fridge and then put that cold liner with the cold potatoes into the slow cooker to reheat. It sounds like a great time saver, but it’s just not safe. Your potatoes won’t come up to heat fast enough to be safe. Just don’t do it, no matter how many times you think you’ve gotten by with it. Follow the recipe. If you’re making these potatoes ahead to reheat in the oven, put them in a large, shallow casserole, like 13 x 9″ pyrex pan or fancy equivalent, put in the fridge and cover when cool. If you’re planning on reheating in the slow cooker, do the same in a shallow bowl or food container. If you double the recipe, it’s best to store, whether you plan on reheating in the oven or in the slow cooker, in two containers. Refrigerate promptly. Add potatoes and salt to a large pot, cover with water by about 2 inches. Bring to a boil and cook until tender when pierced with a knife, but not falling apart (check several) about 20 to 25 minutes. Drain the potatoes well, return to hot pot and let them sit for a bit to dry. Gently turn with a spatula. Turn burner back to low heat if needed. Once the potatoes are dry and most of the steam has dissipated, mash, making sure to get the potatoes from the bottom edges of the pot, using a spatula if needed. When broken down, add the butter and mash to desired consistency. Take off heat and add the cream cheese and sour cream and milk, then salt and pepper to taste. Mash to combine, preferably by hand this time. Don’t mess with these after they’re all mashed and stirred together; they can get overworked and/or watery. Trust the process. Better to have a lump here or there than overworked/watery potatoes. If planning to reheat by baking, place in casserole dish and refrigerate. Cover when cold. Reheat at 350 degrees for about an hour topping with additional butter before baking. Top with chives before serving if desired. If reheating in the slow cooker, refrigerate potatoes in a container (not the slow cooker liner) and cover when cold. To reheat, add the potatoes to the slow cooker, cover and cook on low until potatoes are hot and warmed through, one to two hours. They can be held for about an hour longer. Stir gently about halfway through. Before serving, top with butter and chives. If recipe has been doubled, heat the potatoes carefully on the stovetop before placing in the slow cooker. I’ll be sharing my Make-Ahead Slow Cooker or Oven Mashed Potatoes at Fiesta Friday #250, cohosted this week by Jenny @ Apply To Face Blog., Jess @ Cooking Is My Sport, Jhuls @ The Not So Creative Cook and Judi @ cookingwithauntjuju.com. Thanks, guys for hosting for us for so many Fiesta Fridays! #250 is a landmark for sure! This entry was posted in Click here for Fabulous Food Posts and tagged Cream, Cream Cheese, mashed potatoes, milk, Potatoes, Sour cream. Bookmark the permalink. Can you freeze leftover mashed potatoes? There is just 2 of us. I have heard that you can and I have never tried it. I think it is Cook’s Illustrated that says mashed potatoes can be frozen and they are usually reliable. ThNks. Maybe I will give it a try. Thanks. Maybe I will give it a try. I mixed up some of my leftovers up with an egg yolk for roughly each 1 1/2 cups of mashed, added a pinch of nutmeg and a little bit of parmesan and baked at 425 degrees until they were hot and bubbly and they tasted like a brand new dish. Kind of a Duchess Potato Casserole. Yea – a slow cooker recipe – I have 6 of those. Maybe I can talk my sister into making them this way – I mean there is only so much room stove top. Thanks for sharing one of my favorite sides with lots of gravy of course. Happy Fiesta Friday Mollie! Thanks judi & thanks foe hosting FF for us! Thanks Jess – last minute Thanksgiving can get crazy hectic! Thanks Anonia! It’ nice to get the mashed out of the way sometimes! Anything you can do ahead helps! 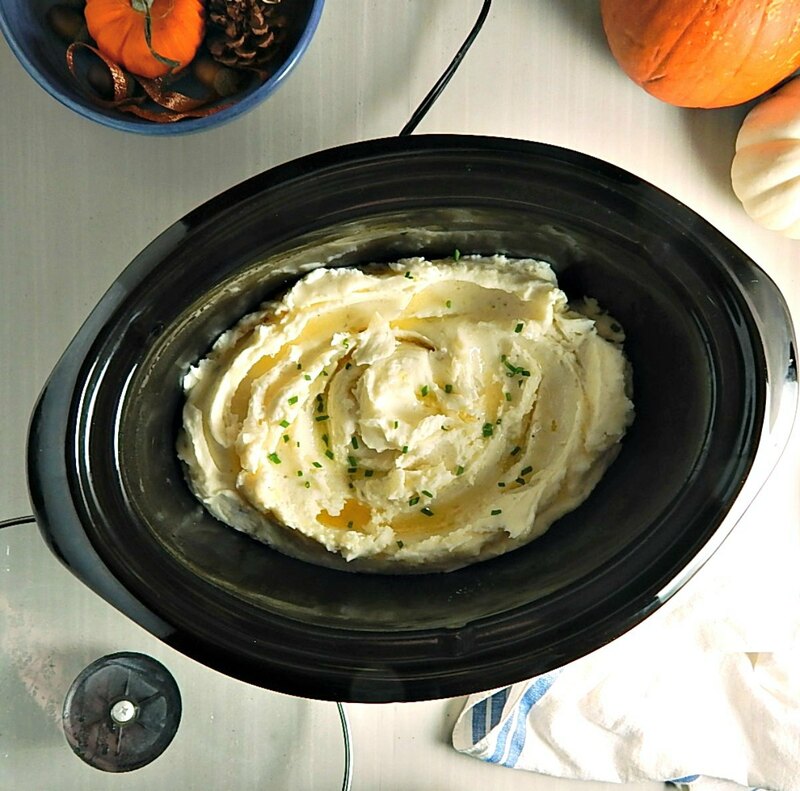 I’ve never done mashed potatoes in the slow cooker! They are one of my all time favorite foods, so I’ll have to try this new technique out! It’s best for a crowd and they’re very good, but I have to say my fave is the other mashed potato recipe i posted earlier this week. These are a close second! Hi and thanks! And yes, very rich and creamy and tasty! I always wonder what other people from different areas think of our crazy obsession for potatoes, lol!! I know there are iconic potato dishes from all over the world but we in the US seem to be a bit crazy about them! I could just live on mashed potatoes!